Paper notebooks are so handy specially one that is the right size to travel with you where ever you go. 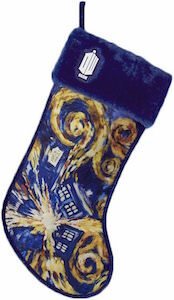 And if you are a Doctor Who fan then you are in luck because this is a mini journal just for you. On the outside of the journal you can see Vincent van Gogh’s painting of the exploding Tardis and that makes this so cool to own. Inside the Doctor Who notebook you will find lined pages and there even is a nice elastic to keep it all closed when on the go. 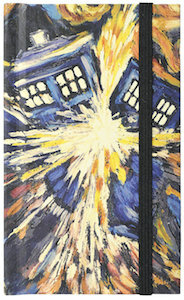 The exploding Tardis journal is 3 x 5 1/2 inch making it perfect for in almost any bag or even a jacket or pants pocket.